Life runs better with unlimited perks, which is why Dunkin’ Donuts is excited to announce today the launch of our national loyalty program, DD Perks Rewards. Starting today, guests that use their registered Dunkin’ Donuts Card (also known as the DD Card) at participating restaurants throughout the country, will earn “Dunkin’ Dollars” – coupons valid for our famous coffee, beverages, donuts, breakfast sandwiches and snacks – based on how much you spend at DD each month. We like to think of it as rewards your way, because there’s no cap to how many Dunkin’ Dollars you can earn each month, and you get to use your coupons on your favorite foods and beverages at DD. In celebration of the DD Perks Rewards launch, we’re excited to announce that for every Dunkin' Dollar guests earn from April 5 through April 12, 2011, the company will donate $1 to The Dunkin’ Donuts & Baskin-Robbins Community Foundation to benefit the USO, with a total donation of up to $10,000. If I’m Already a Dunkin’ Perks Member, do I Need to Sign Up for DD Perks Rewards? DD Perks Rewards builds off of our existing Dunkin’ Perks program, where members receive a free medium beverage upon enrollment, plus another free medium beverage on their birthday. Therefore, if you’re already a Dunkin’ Perks member and you’ve registered your DD Card on DunkinDonuts.com, you’re all set. If you haven’t registered a DD Card on DunkinDonuts.com yet, click here to register your Card to start earning Dunkin’ Dollars. How Do I Sign Up for DD Perks Rewards? Signing up is quick and easy – simply register your Dunkin’ Donuts Card. DD Cards are available online and in participating DD restaurants. 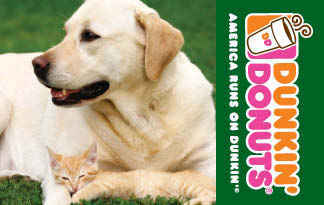 We also offer the option to create a personalized Dunkin’ Donuts Card with your favorite photo. Is There a Cost to Enroll in DD Perks Rewards? No, enrolling in DD Perks Rewards is free! How Do I Earn Dunkin’Dollars? Guests will earn one Dunkin’ Dollar for every $20 spent usinga registered DD Card, or two Dunkin’ Dollars for every $20 spent using a registered DD Card set up on auto-recharge. Rewards earned are based on spending during any given calendar month. When Will I Receive My Dunkin’ Dollars? At the beginning of each month, we'll send you an email stating how many Dunkin’ Dollars you've earned. You will receive your Dunkin’ Dollars via U.S. mail by the end of following month in which you’ve earned your reward. Will My Dunkin’ Dollars Ever Expire? Yes, your Dunkin’ Dollars will expire about one month after you receive the rewards coupon(s) in the mail. We’d hate to see you miss out on your DD Perks Rewards, so please check the expiration date when you receive your Dunkin’ Dollars. For more FAQs on Dunkin’ Perks and DD Perks Rewards, click here. To sign up for DD Perks Rewards, click here. What will you spend your first Dunkin’ Dollar(s) on? Leave a comment below to let us know!